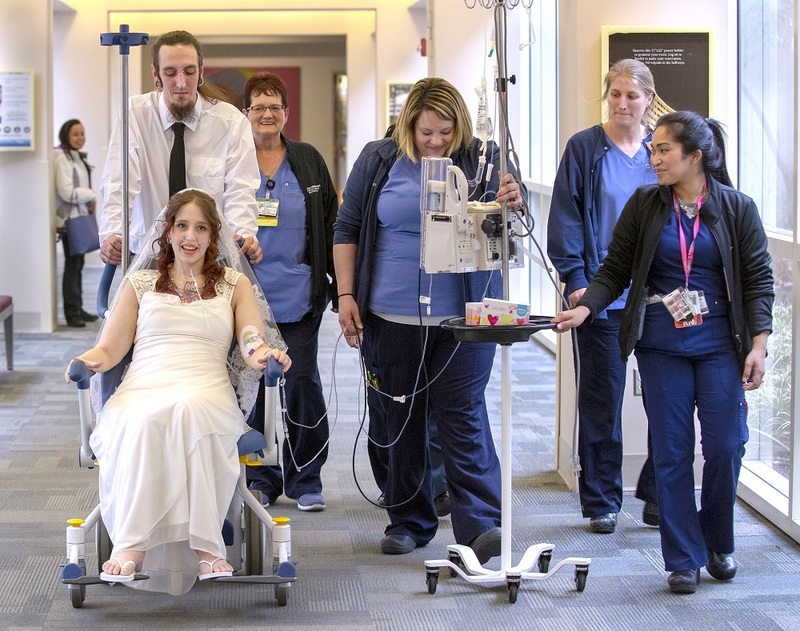 Anthony Chalker wheels his fiancee, Maggie Garrett, to the hospital chapel for their wedding ceremony with the help of staff from Penn State Health Milton S. Hershey Medical Center and Penn State Cancer Institute. Maggie Garrett always picks the winning scratch-off ticket. The one her longtime partner Anthony Chalker handed her on Nov. 11 was purple – her favorite color. So she dove in and started scraping off the gray stuff to see what her prize might be. Garrett needed a run of good luck. More than a year earlier, doctors told her she had cervical cancer. She’d gotten treatment, and her health had improved. Three diamonds emerged on the surface of her ticket. She kept scratching to see what her prize might be. Words appeared. “Maggie, will you marry me?” they read. She glanced up from the ticket and found herself staring into a diamond. This one was real, attached to a rose gold band. Behind it, knelt Anthony, the love of her life and best friend for more than a decade, the man with whom she was raising three children. The wedding, they decided, would be Feb. 11. Then fate darker than the lottery-ticket variety stepped in. Garrett’s cancer returned. Stage four, doctors said. At 28 years old, her prognosis gave her only weeks. Feb. 11 came and went. Garrett was admitted to Penn State Health Milton S. Hershey Medical Center to fight it out. 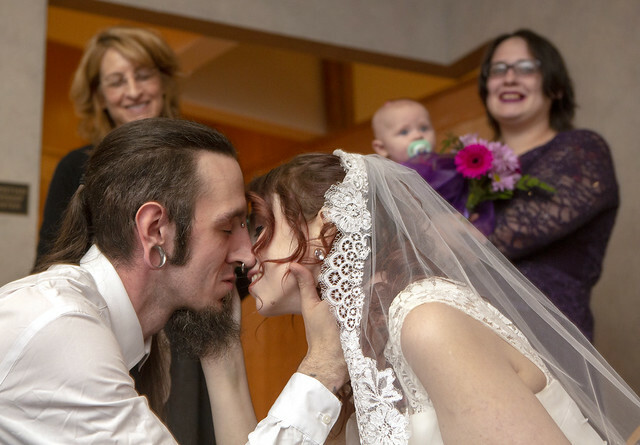 Then the family – Garrett, Chalker and their children – decided they’d have the wedding on March 14. It would take place in the interfaith chapel, five floors under Garrett’s room in acute care. Hospital staff would pitch in tablecloths, shoes, makeup and refreshments like the village in the stone soup story. After all, everyone decided, sometimes scratch-offs know more than cancer when it comes to love. Just before the wedding, Christina Banhardt, a patient care assistant on the fifth floor, makes an hour- and-a-half trek east on the turnpike to David’s Bridal, where she buys a white lace veil. She pops across the street into an Ulta Beauty store and buys lipstick and eyeliner. Back at the Milton S. Hershey Medical Center, social worker Jenn Heinemann pitches in with odds and ends, such as “Mr. and Mrs.” wine glasses for the toast. Patty Spisak, an administrative assistant in Patient Experience, finds a tablecloth – purple, of course ― and takes it to the chapel, covering it in rose petals and flowers. In a nearby room, she hangs balloons. Beverages are procured. Cakes are arranged. Barnhardt and Spisak have never been to a hospital wedding before, but the Garrett-Chalker nuptials isn’t a first rodeo for everyone. Thu Thi Gazzio, a registered nurse on the 5th floor, has helped patients with birthday parties, anniversaries and parties of all stripes in her six years at the hospital. “Once, we did a [wedding] in a patient’s room,” she says. Another happened in the Lion’s Den, a big room at the end of the hall. Garrett spent much of the day sleeping to gather her strength. The day before, she’d received one of her many treatments. Her voice was weary in the early afternoon. “It’s rose gold,” she says, offering a hand, to show the ring Chalker knelt to give her on Nov. 11. The diamond lists and presses against a knuckle. “I’ve lost a lot of weight since then,” she explains. They’d met as teenagers. Chalker was visiting a mutual friend who was throwing away a set of antique chairs. The friend said Chalker could break them up, if he wanted. Chalker, being a bored, rambunctious kid, jumped at the chance to destroy something. Chalker was in mid-destruction when Garrett walked in, confused that some random guy was destroying the furniture. Later, Chalker gave her a ride home. They were members of the same herd. They hung out at Twist, their favorite club in Wilkes-Barre, which has since closed down. Eventually, the friendship became love. Then came Zachary, who is now 10 years old. Next was Nicholas, 6. Melody arrived almost two years ago. Though new, the ring looks somewhat dull in the light of the hospital room. “I’ve just worn it so much,” she says. By late in the afternoon, family members and friends from the Twist days begin to arrive. Bill Eaton and his girlfriend, Flexcia Delevine, have come all the way from Wilkes-Barre, a two-hour drive. The families gather in the Garretts’ room. Chalker arrives with a bag of Arby’s. Everyone has kids these days – cousins, nieces, nephews and friends chase one another past medical equipment and hospital furniture. Barnhardt curls, teases and swoops Garrett’s hair. She adds lipstick. Garrett’s illness seems to evaporate. She sits up straight in the bed and examines a mirror. “My lips still look thin,” Garrett says. “Well, you have thin lips,” Barnhardt replies. They laugh. Other nurses wander into the room and fawn over Garrett. Some, such as Barnhardt and Colleen Lopko, have forged tight bonds in their short times with Garrett. Lopko, a staff nurse, said she was blown away by Garrett’s gratitude and kindness in the face of everything. Just before 5:30 p.m., Barnhardt knocks on the door, where someone has taped a “Do Not Disturb” sign. “Mags?” she says. Then she opens the door and goes in. Moments later, Garrett and Chalker emerge. She walks gingerly, the white shoes Barnhardt brought her protruding beneath the stunning white dress. She beams as she sits in a wheelchair the nurses have set aside for her. Garrett, who wears black pants and a black tie Windsor-knotted into a white sport shirt, takes her to the elevator. In the interfaith chapel, two women play an acoustic guitar and a small keyboard. One is Christina Myers, a music therapist with Penn State Children’s Hospital. Myers has visited with Garrett for the past couple of days deciding on what music she’d like. She picked the Beatles’ “Let It Be,” “Here Comes the Bride” and “A Thousand Years.” Myers’ job was to help Garrett choose music that had meaning. “It is a day of love and a day of joy,” Chaplain Resident Rose Baer announces to the congregation. Her colleague, Kelsey O’Brien, a chaplain for palliative oncology, knew Garrett and would have officiated if she hadn’t been at a conference. On her weakened legs, Garrett walks into the room, arm looped into her father’s. She and Chalker sit in two chairs and face one another. They slide in closer when it’s time to hold hands. “What, you’re going to take my line?” Garrett says, cutting in. Melody takes a tumble to the chapel floor. Chalker picks her up. Family circles to soothe the crying child. Family and nurses gather in an anteroom near the chapel for a reception. Cake and sparkling cider are served. Baer, who just met the couple a few days earlier, joins in. It is her first wedding ceremony like this, but nothing in what she said during the ceremony gave any clue that today’s wedding was different from any other. And maybe it wasn’t. The ceremony was about today, Baer says, not tomorrow. It was about celebrating two lives merging. Whatever comes next is the prize under the scratch-off.